Watch the Original Night of the Living Dead… Here, Now!!!! Well this movie came out of no where – a Netflix suggestion for a friend of mine, it’s a movie that neither of us had heard of before. Well, I’m kind of glad we watched it. The gist of the story is a stripper in 1984 Texas, Cherry, gets raped and beaten in the “Champagne” room at the club she works at. The perpetraors get away with it through collusion and intimidation. Without legal justice, Cherry, and reluctantly her brother, take matters into their own hands and exact mortal payment for their trangressions. Yes, this is a tale of revenge. The acting isn’t great and the story is simple, yet I enjoyed this pseudo throw back to the 80s. Plus: it’s always fun watching assholes get what’s coming to them. Also, they are being stocked by a tough, ugly and huge hitman. If you’re looking for a good movie, well this isn’t it. If you’re looking for a good enough movie that doesn’t make you think too much, then this just might fit the bill. I We found it on Netflix – Check it out if you get a chance. 2011’s God Bless America is a masterful tale of a man that is just fed up with the dumbing down of America and does something about it. 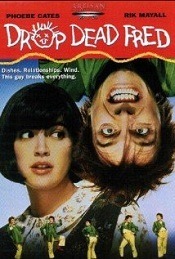 I watched this movie on the suggestion of two of my friends (Thanks Clint and Sonny). They suggested a fantastic movie. This is a Bobcat Goldthwait movie (both written and directed), that really hit me where I live. It’s a statement about how Western society (specifically the U.S. of A.) has degenereated to watching useless, despicable humans on TV as reality stars, and how common decency has fell to the side of the road and has been replaced with jadedness and laughing at the unfortunate and celebrating the worst parts of humanity. Frank, a recently unemployed man who hates what America is turning into decides to take on that which he hates – killing reality stars and other losers that get in the way. Along the trip he manages reluctantly (at first) to pick up a teenaged girl sidekicj who is also sick of what her world is turning into. The two leave a trail of (deserved) destruction in the wake as they work towards a mighty goal (see the movie to figure out what that is). They also discover what makes each other tick along the way. This movie made me root for a couple of killers – and that is a pretty amazing feat. If you are looking for a smart, enjoyable film, and you too hate the dumbing down of society, then I suggest you watch this movie – NOW! Creepshow (1982) – Comic Book Horror From the 1980s! 1982’s Creepshow is a homage to the old 1950s E.C. comics of the same name. For years E.C. 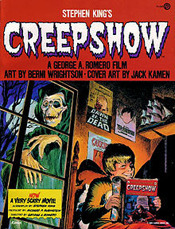 comics brought horror to the imaginations of the youth through their Creepshow comic. This movie brings that comic creepy-fun to the big screen. George A. Romero and Stephen King bring five tales of terror to the screen with many big (at least for 1982) stars. This movies is a wild, fun ride through the horror genre with a little bit for everyone. See a jealous husband (played by Leslie Nielsen) get revenge on his wife and her lover… just to see the tables reversed soon after. Or maybe you’s rather see a hen packed husband (played by Hal Holbrook), help a friends with a sticky situation while taking care of his alcoholic, abusive wife (played by Adrienne Barbeau). Or maybe a hillbilly (played by Stephen King) that turns to a weird plant/animal after messing with a meteor that that falls in his back yard. Like I said, there’s enough for everyone here. For younger fans of horror, I am sure this is going to come across as pretty cheezy- hey, get over it! This movie is about classic comic book horror, and if you can’t get your head around that then it just wouldn’t be for you any way. Thay said, this is a fun ride that I think you should take! or watch the youtube post here – either way, make sure you go to their site now and return often – good stuff over there! Parents is a 1989 film, set in 1950’s suburbia is the story of a boy, Michael who discovers that his meat loving parents are cannibals. This is a fun, funny stylish flick that I am surprised that I had never even heard of until earlier this week. Starring Randy Quaid as Nick Laemle and Mary Beth Hurt as Lily Laemle, Michaels parents, they play convincing mid-20th century parents… with a taste for Human flesh. Michael, already an odd little boy,being raised by odd parents, suspects that something just isn’t right with his folks. Poking around, he finds hints but no answers to their weirdness – that is, at first. Eventually he discovers their secret, and that of course, put him in jeopardy. This film is stylish with great visuals and a great cast. The story, while macabre, is engaging and fun. I have absolutely no issues recommending this silly film.